Hosting Thanksgiving this year? Want that perfect dream of everyone spending time together, and not just while stuffing your faces with stuffing? One of my favorite things to do during family gatherings is to play simple games that work for all ages. 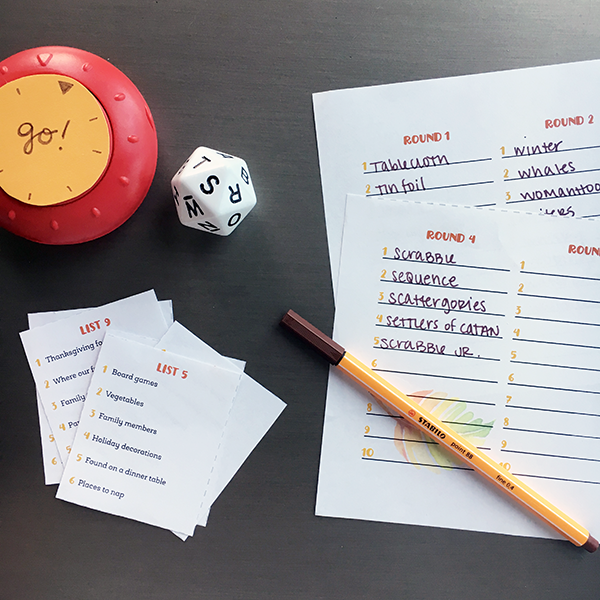 In the past, I've shared a few free printable games, like Bingo! and Thanksgiving Charades, that were a big hit. This year, I wanted to switch things up a bit. 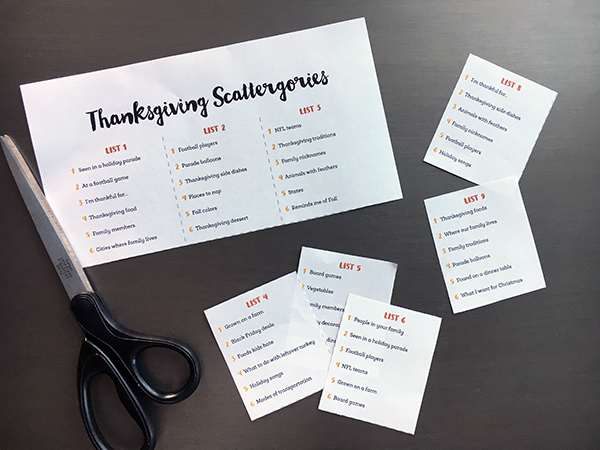 Which brings us to Thanksgiving Scattergories! Did you know there is an 'r' in the middle of Scattergories? I've totally been saying "Scatt-a-gories" my whole life but feel like I've finally discovered the truth. There are TWO parts to this printable, but I promise I did that for a good reason. Part 1 is your topic cards. 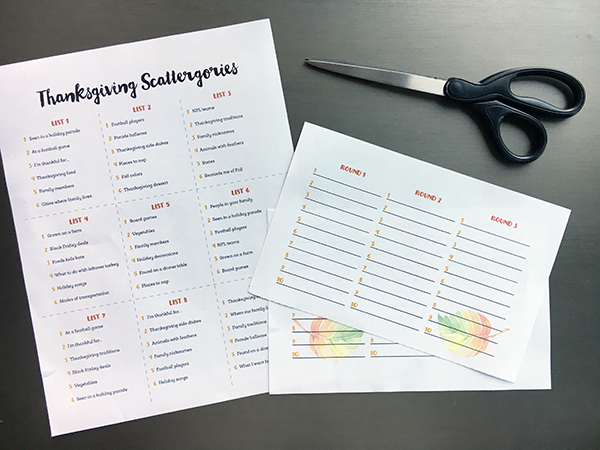 You'll want to print these on card stock, and cut them along the lines, so you have cards similar to those found in the traditional Scattergories box. You'll also need a timer and an alphabet die. I grabbed mine from our normal Scattergories box. If you don't have an alphabet die, you could write all the letters of the alphabet on a piece of paper, cut them up, and have someone choose randomly from a basket. Or, use the letters of your family's last name. 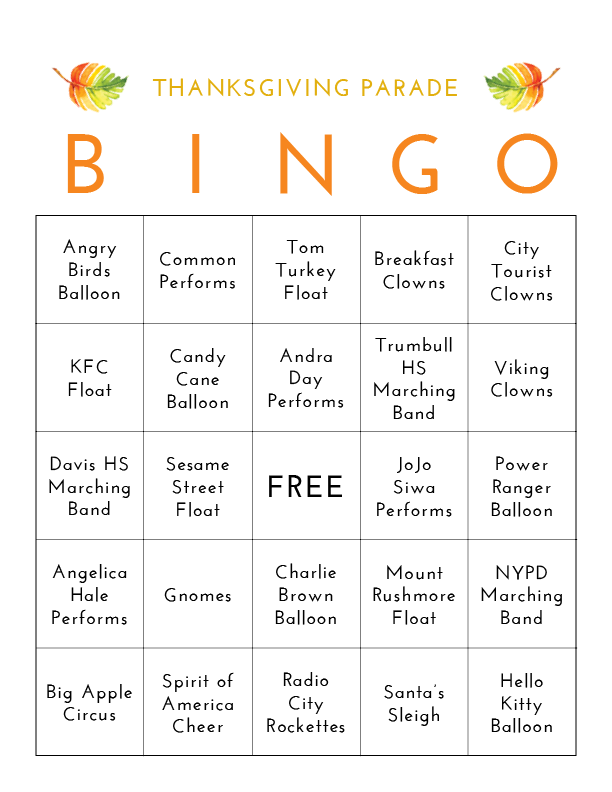 I've also updated my Thanksgiving Day Parade Bingo cards to fit what we'll see in the parade this year. If we're going to be around the TV, we might as well make it a game for our families as well. There are so many types of clowns in the parade this year! And some awesome new floats and balloons I can't wait to see. There are seven different cards in this PDF so everyone isn't shouting BINGO! at the same time, and there's a chance for everyone to point out all the new stuff in the parade line-up. I love the tradition of watching the parade together, and how this simple game we all know can make it an activity for all generations. If you print and use these games, post a photo and make sure to tag me on Instagram @meredithplays!